It’s a five hour drive to our next stop, Jodhpur. Joginder has decided to make it a personal hygiene day. He has a little array of cotton buds (Qtips) on his dashboard and begins to meticulously clean each ear with them. And when he feels they aren’t doing the trick he resorts to the end of a pen and then to his finger. When he has finished with his ears, he moves on to his teeth. He adjusts the rear view mirror until he can see his face. He pulls out a tooth pick the size of a small pneumatic drill and proceeds to use it accordingly. He digs, prods and spits until there is not one bit of last week’s meals left, periodically baring his teeth and checking them in the mirror. We might not find this quite so bad if he waited until there was no traffic to do the mirror work. But he doesn’t. His teeth seem to be far more important than the on coming traffic. Next he works on his stubble. He hasn’t shaved since we left Delhi and his stubble needs grooming. This he does section by section using his finger nails, first scratching, then pulling and tweezing. It is a long and rather unpleasant process to watch. To be fair to Joginder, although I must admit I have no desire to be, he goes to some length to explain that while we are staying in a nice hotel he is either in his car or some cheap hovel. “I am not a rich man” is his refrain. He explains that every morning he always showers before meeting us, which is nice to know. But that morning was bitterly cold, and he had to shower with cold water. He is not happy about it. After a couple of hours we stop at an old fort. Joginder tells us that very few people come here. He tells us to take our time wandering around the fort as he is going to have lunch. The fort commands very little of our time and when we return to the car we discover that Joginder hasn’t been having lunch at all. Instead, he has taken the opportunity to wash some personal items. His underpants and a small towel are hanging from the car drying in the sun. He hurriedly throws them into the back of his bedroom and we continue on our way. 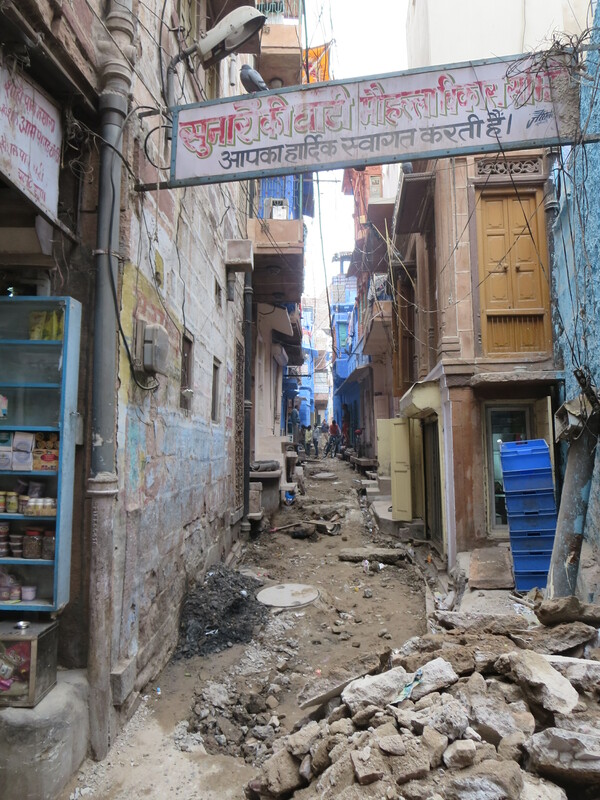 When we arrive at Jodhpur we realise why Joginder has been cleaning himself so thoroughly. 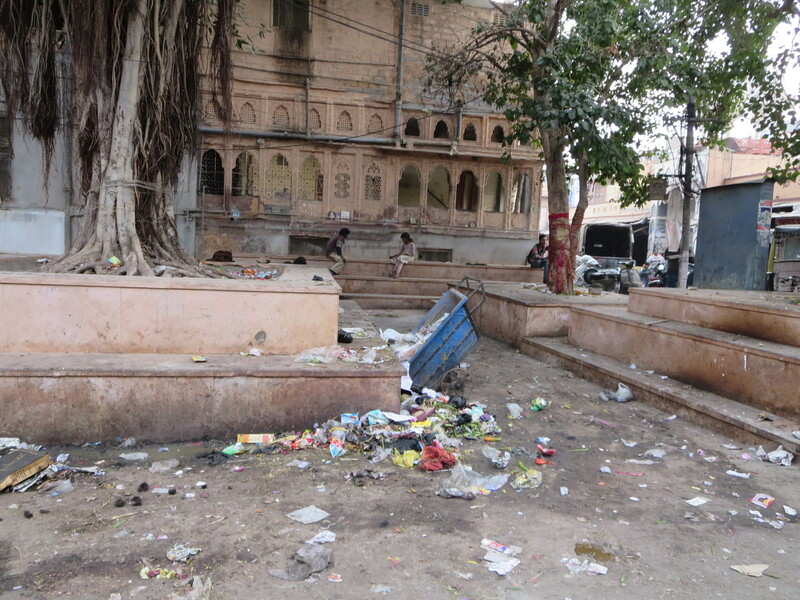 Jodhpur is squalid. Everywhere you look there is cow dung, bird droppings, dog excrement, litter and unimaginable filth. And the people chew betel nut chewing gum and periodically produce huge quantities of red spit that they eject into the street. It is an unpleasant habit and one more more thing you have to avoid. Open drains run down the narrow streets and children play in them bare foot. The poverty is heart wrenching. Our first reaction is to wonder how they can live like this. However the truth is there is no garbage collection and no street cleaning. Most homes that we are invited into are very clean. The problem is where should they put their rubbish, and sadly it seems that the only answer is to throw it out on the streets. Despite everything it is still a fascinating place to visit. We spend several hours wandering the streets. Gordon tires of it before I do. I am still having fun when a huge amount of red spit catches me on the leg and runs down my trousers. The fun is now officially over. I can’t get back to my luxurious room fast enough. I hand over my clothes to the hotel laundry and jump in to a hot bath filled with aromatic bath salts. I wonder how Joginder is doing? 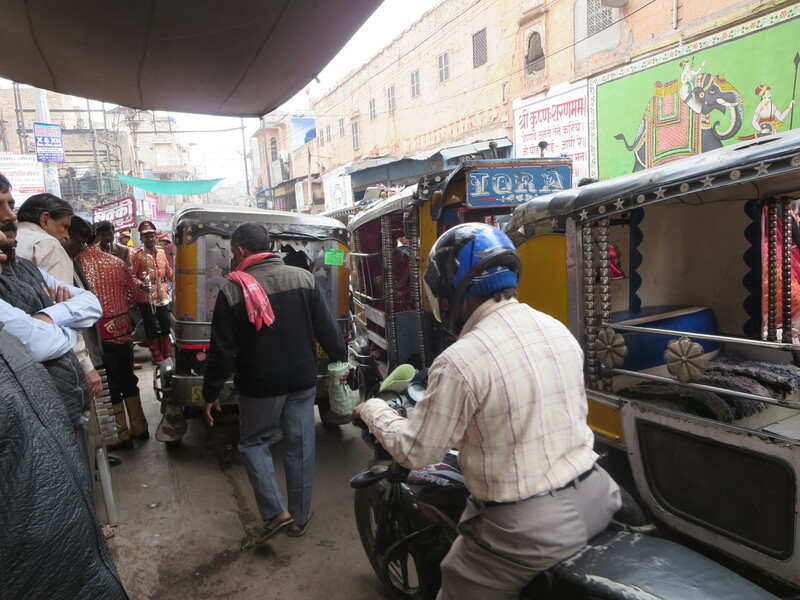 This entry was posted in India, Uncategorized and tagged Jodhpur. Bookmark the permalink. We “Remember it Well” – sounds even more squalid then ten years ago. Not impressed with the driver and his ablutions, very good of you to tolerate that grooming session. Joginder definitely leaves a lot to be desired, but if we fired him and picked up another driver, would he be any better?? It’s a dilemma. A really well written piece. I almost feel as though I’m there. And that’s close enough! I am so happy to be doing this trip vicariously. Thanks Baz. We wish you were here with us – think of the laughs we would have!! hahaha! Guess I should just not go to Jodhpur as was planned and go some place small in Rajasthan , like Bundi, eh? Also, I just realized that this trip actually going on right now! Brill, Happy wandering! Don’t let a bit of squalor put you off!! It’s all part of the experience. But I have to say that Jodhpur is my least favourite city so far. I am new to following your blog and really enjoy your style, both your writing and personal style. It makes one want to get on a ship or a plane. You are doing a great job with the photography. Thanks so much – glad to have you along! 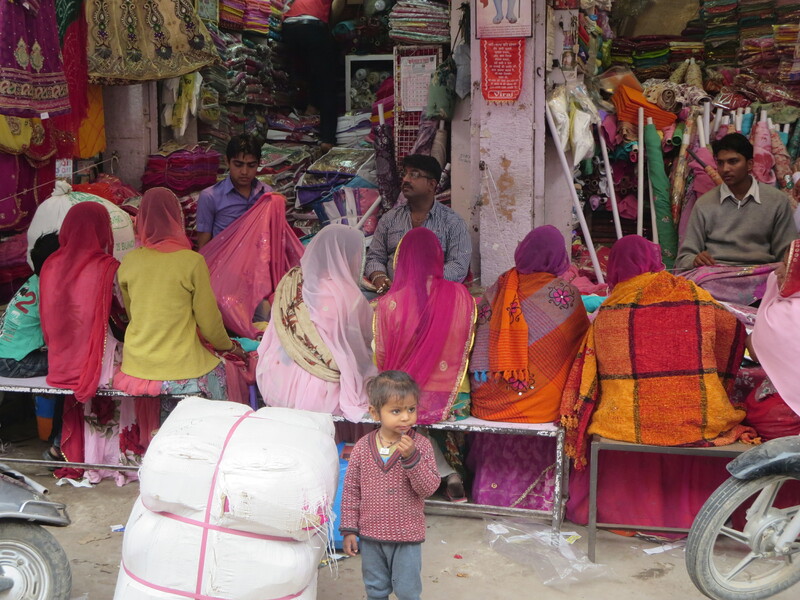 So glad to hear I’m not the only one who isn’t impressed with Jodhpur. I’ve read with astonishment glowing reports about Jodhpur on a popular India travel forum and wondered how it was possible. With rose colored glasses only, I imagine. Jim Rowe from Cape Elizabeth, Maine, USAGood adventure. Camels are relaly weird, but sure serve a purpose. I didn’t know they have wild ones there. One photo with you two and a camel is relaly funny. Camel appears to be smiling for the camera.